Ready access to research data is a cornerstone for success in science. Researchers need to keep track of their data & improve its impact through increased re-use. Universities want to eliminate re-work, showcase research outputs & improve collaboration inside and outside to drive research performance. These needs become more urgent as international funding bodies revise their policies to encourage, or even mandate, institutions and their researchers to make research data available. 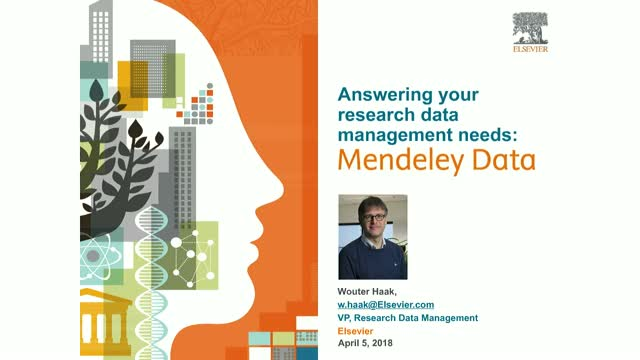 In this webinar we will introduce Mendeley Data, a platform designed to facilitate the comprehensive utilization of data. Consisting of five modules, this open, cloud-based platform helps research institutions to manage the entire life-cycle of research data, and enables researchers to safely access and share information wherever they are.